Increasingly, new academics are entering higher education without conventional research training and without a clear idea of what research actually involves. This is particularly true of academics who enter from having spent time in a profession including many in the newer disciplines. In addition, institutions of higher education which do not have a tradition of research are increasingly competing for research funding. The Nature of Research looks at this background and discusses what is wrong with academic research and discusses what is wrong with academic research today, what needs to change for it to survive, how to allow new kinds of research to flourish, directions for future action and how academic research can teach us to live in today's complex and uncertain society. 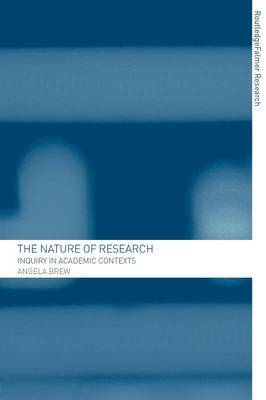 The aim of the book, then, is to provide a stimulus to thinking about the nature and role of research with a view to considering what might be appropriate in the next century. Since research is so central to university life, looking at research will tell us much about what the university of the future might be like.